I made this purse for myself but my daughter decided she wanted it instead. The design is based on the cell phone purse pattern on Provo's website. There are a lot of mistakes in it, but once I felt it, a lot of the mistakes will be hidden (isn't felting wonderful???). There isn't anything special about the design. 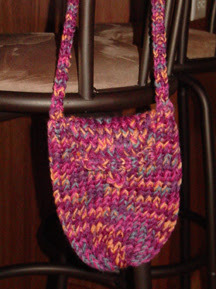 I created a v-shape for the flap by knitting on my loom 1 stitch and increasing to about 12 stitches or so and then I just increased my stitches to the entire loom (similiar to the cell phone purse design only I created a v-shape). 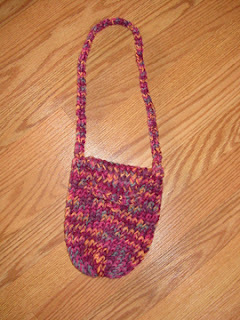 After I reached the desired length for my purse I took off my stitches just as you would to finish off a hat. I then flat knit a small piece (2 stitches) and whipped stitched it to the front of the purse and tucked the v-shaped flap underneath to close the purse flap shut. I attached the handle by hooking the body directly onto my loom and then I just started to flat stich three rows until it was long enough. I attached the other end of the purse to this piece, knit a row and then used a crochet hook to remove my piece from the loom. I learned the Purl stitch today. I have to say I dislike this stitch because it doesn't go as quickly as it does with the basic knit stitch I've been doing up til this point. I remember hating to purl on knitting needles too, oddly enough! I think I broke my little and second to little toes tonight! I am always racing around this house like a maniac because it is such a busy household and I came around the side of our master bed and caught my foot on the foot post and went down to the floor. This was well over an hour ago and man is it ever throbbing! The two toes swelled up pretty good too! They hurt pretty bad to bare weight on them. Oh well, I guess I'll just have to put them up and do more loom knitting (hee, hee). 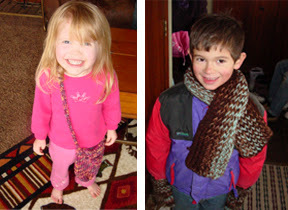 Here is my son with the scarf and matching mittens I made and my daughter (who confiscated the purse I just knit). I just learned the pcaston & the flat removal method! What would I do without Isela Phelps? Her step-by-step directions are wonderful. Visit her blog for a wealth of information on loom knitting http://isela.typepad.com/ I've learned how to cast on the loom using a crochet hook. This creates an edge that is not loopy and loose. I also learned how to use a crochet hook to cast off of my loom and finish off my projects. Tip time: I have had my eye on one of those nifty yarn dispensers I spotted at my craft store (I believe Walmart carries them too). 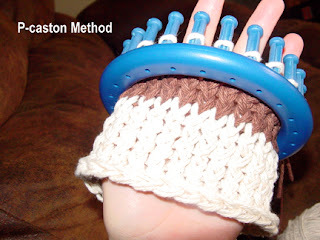 I decided to just make my own since I am always the thrifty knifty knitter (have you noticed my free ideas to save on buying expensive knitting supplies?? ha, ha). I emptied my AromaSeal coffee container (Folgers) the other day and a little light went off in my head. I washed it out thoroughly, took a nail and hammer and poked a hole in the lid and then took an awl and made the hole much bigger. Presto! A free yarn dispenser and it took only seconds to make! My eight year old stepdaughter has been home with the chicken pox since Monday. Yesterday she started feeling much better so I started showing her how to loom knit using the blue KK Loom. I was very, very tired from being up all night the night before since my one year old just contracted the chicken pox (she was just miserable, she cried all night and the only way she would sleep is with me holding her on my chest laying down on the couch--a couch, mind you, is not designed for sleeping on at all and is the most uncomfortable thing!) Well, anyway, I was completely wiped out and needed to lay down while the baby napped so I took my three year old to bed with me to keep her out of trouble. I let my stepdaughter to her own devices and when I got up an hour later she had a great deal done. Unfortunately, she also had a huge hole in her work. I recognized it immediately as dropped stitches. I asked her what happened and she just looked up and me, shrugged her shoulders and grinned. I told her that she may as well stop since it needed to be fixed before she could continue. She was making a hat and her hat would have had a big hole in it! She was just devistated to learn that if I couldn't fix it that she would have to start her project all over again. I told her that I would do my best but I couldn't promise her it would turn out ok. I made the same mistake when I first started but caught it right away and was able to just unwind my ewraps the rest of the way around and only undo a few stitches from the loom. Her's unfortunately was just about in the middle of her project! Aaaaaaagh! I thought for a moment when I sat down to repair her project and a flash of brilliance struck me! This leads me to my next tip: To fix a dropped stitch, first take all of the loops off of the loom and carefully pull on the working yarn until you are past the row with the dropped stitches, then thread a long twisty tie through the loops (a cable tie that is smooth and has a locking mechanism at one end would work just as well), secure the end of the tie at the last loop in the circle and begin placing the loops back on the loom. The twisty tie will prevent the loops from being pulled out while you secure the loop preceding it back on the loom and it is extremely flexible (unlike stitch holders) so it will conform to the shape of your loom. I haven't written a blog in a few days because I have four children with chicken pox. The twins have it now and my two youngest! Man, that's a hand full all at once. I was able to manage to get my son's matching scarf and mittens done. I promised him I would start the hat too one of these days. I have one more pair of mittens to make for my three year old. She keeps asking me why I haven't made her any mittens yet. I am anxious to start my 100% wool purse I intend on felting. My sister made one with knitting needles and it is so darling. I don't have a a pattern for a purse but have one planned out in my head how I can do it. It may not turn out, but I have to try. At least I can tear it apart and start over if my idea isn't working. If it works, I'll share my design on this blog. Next tip: Use a pen and piece of paper and make tick marks after you knit a row. After you have four marks, on the fifth, cross the four rows off and start making tick marks again. This is free and doens't take put a second. I know the row counters you purchase are probably faster but I looked into buying one and it was expensive. Today was a busy day. I got all of the house cleaning done and got to the end of that giant pile of laundry! I sat down this evening and finally finished my fourth pair of mittens. I made a pair for my son who is by far the worst offender of losing his gloves and mittens. It is just crazy, he is constantly coming home without anything on his hands or on his head. Yesterday he had a cough and I told him to get a hat on his head as he was leaving for school. He right away said he lost it on the bus. Apparently he has a little theif that keeps taking his stuff (an older boy). Well, he is in luck, his set of mittens are done. I finished his matching scarf too. I still need to start on his matching hat. It really is a nice set. It has three shades of brown and a light blue in the yarn. I will need to post some pictures soon. I got my Crafters Choice catalog yesterday. I really enjoy this book club. It is by far the best club I've been in. There are several knitting books I would love to order. If you are looking for a great craft book club, this club is an excellent choice! I ordered a loom knitting book last month. It was on backorder and will not ship until sometime in February. I am chomping at the bit with anticipation to receive it. It was written by Isela Phelps. I have found a lot of valuable information online from Isela. Thanks Isela for your helpful information! If anyone was wondering why I started this blog I'll explain. I picked up a knitting loom for the first time back in November of 2006 after my sister took me to this quaint little yarn shop in Avon, MN where she purchased some knitting needles and a couple skeins of yarn. She pointed to a loom while we were there and said her friend's daughter was knitting hats with one of them. I picked it up and inspected it and it piqued my curiosity. I learned to knit with knitting needles from my mother when I was a child but hadn't knit anything in many years (simply due to a lack of time due to my large family). Since I am always interested in teaching myself new things, especially anything related to the creative arts, I wanted to teach myself how to loom knit. I went home that day without buying the loom this little shop had but kept the idea in the back of my mind. A few days later I was in Crafts Direct in Waite Park, MN. I walked down the isle with the yarns and spotted a whole pack of knitting looms from Provo Craft called Knifty Knitting Looms. They were on clearance and I couldn't resist. I bought a couple skeins of yarn and an instructions booklet to jumpstart me on my looms. I decided to make a couple hats for my kids since they are forever losing their hats and mittens. It went very quickly! I had a hat made in a couple hours. I knitted up my couple skeins of yarn and sat there wishing I had more. My family and I were in the middle of a move and we had a shed full of boxes packed up with all of our stuff. In one of those boxes I knew I had some yarn stored away from back when I was working on a crochet project. I ventured out to the shed and began digging. I was elated when I found a skein of bright red and bright green yarn. I snatched them up and went back inside and sat down with my find. Since it was November and Christmas was just around the corner, it was perfect for a cute little Christmas hat for my three year old daughter. I knit her up a hat by the next day. She loved it! Of course, after knitting up a couple hats, everyone else wanted something! Thus began my love of the knitting loom. I’ve been knitting a little every day on my looms ever since. I have discovered that there are so many wonderful things to knit (I just learned the other day that you can transfer needle knit projects to a loom too). I am just amazed at how quickly the projects go (which is great for me in my busy family of eight). The results from a knitting loom make me look like an expert knitter who has been knitting for years! My sister is enjoying her knitting needles and I am enjoying my knitting looms. I am now here in this blog, typing away with the intent on sharing my ideas and teaching others while I learn and hopefully find some other loom knitters out there who I can connect with and learn from too! Of course, being the creative person I am, I will from time to time discuss my other creative endeavors too! 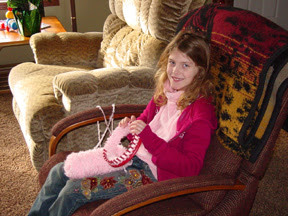 I also can’t leave out mention of the recipients of all of my little loom knitting projects – my six little children. The first tip I would like to share: if you only have a couple stitches to hold, instead of a piece of yarn or a stitch holder, use a twisty tie. My latest project called for dropping just two stitches and placing them on a stitch holder or a piece of yarn. I found threading a stiff twisty tie into the loops and pulling them right off the pegs was quick and convenient. I just twisted the end of the tie after I snatched up my loops, tucked the tie down into the middle of my loom and carried on with my project slick as a whistle. My youngest daughter (she just turned one in December) has been working on walking for the past month or so. It's fun to see her gain confidence but it is bittersweet because I know she is my last baby and once she starts walking she'll quickly leave her babyhood behind and will be a toddler. I won't miss the nighttime feedings, however. I just don't understand her. She is very different from my other two children (biological) in that she is still very hungry at night. I've read that it is a habit to want a bottle during the night, but to be honest with you, I believe she is hungry! Why else would she sometimes want one and sometimes wake up three or four times and want more? She even will want one and then that isn't enough and she will cry again for another. She eats lots of solids during the day. She especially likes her veggies! She eats a variety of foods and most of them are substantial enough to provide her with energy. I've decided to try and feed her as close to bedtime as possible. I never did that with either of my other two, but I am at my wits end. Instead of being up all night loom knitting, I am up all night feeding my baby! My poor husband works physically very hard all day and he isn't getting enough of his much needed rest to maintain the energy level he needs. He of course can hear her wailing away even though he isn't physically getting up with her, his sleep is disrupted too! I am busy knitting mittens for all of my kids. Six little hands. Boy do I love my mitten knitting loom! I bought it online off of ebay and it sat on my dresser for weeks because I didn't understand the directions. It must have been the stress from planning a first birthday party for my youngest daughter. Then came Christmas. I had good intentions of making six sets of mittens for Christmas gifts but that didn't happen. After all of the festivities, I sat down one day and duh, it sounded so simple. I just started to knit and now have three pairs done. I finished half of a set yesterday. I was feeling really stressed out today and didn't get to the second one because all of the kids came home loaded down with homework. My oldest stepdaughter had algebra again. Arrrrrrrrrrrg! Who else hates algebra? It keeps me from my knitting! I am curious if anyone can answer this question, what does a star symbol mean in algebra? Here is an example: 3*+x=*+x+6. Remember, I had trouble figuring out my mitten knitting directions! Well, time for bed. Thanks for stopping by.